The weather may be all over the place, but it’s definitely the first week of spring on the farm. Jason plants lettuce in the little high tunnel. Silas helps in the little tunnel. All of the lettuce was started from seed under grow lights in our basement. We have much better luck with transplanting lettuce than we do with direct seeding it. Silas’s socks are fun to wash. The water is back on at the farm. Every fall, we shut down our water system to prevent pipes from freezing and bursting. Fortunately, the only repair to the system this spring was a $9 water pressure gauge. 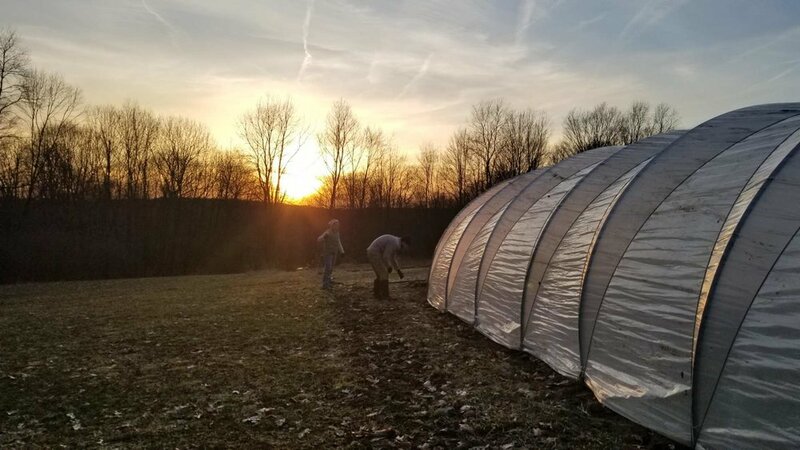 In addition to the little high tunnel and the brand new big high tunnel, we have two caterpillar tunnels. The plastic on the caterpillars is removed each fall because the hoops can’t support snow. Thanks to a perfectly still evening, Angelica, Gary, Jason and I had the plastic and rope on one of the tunnels in under two hours. The caterpillar tunnels get their name from their caterpillar-like appearance when the rope is tightened. 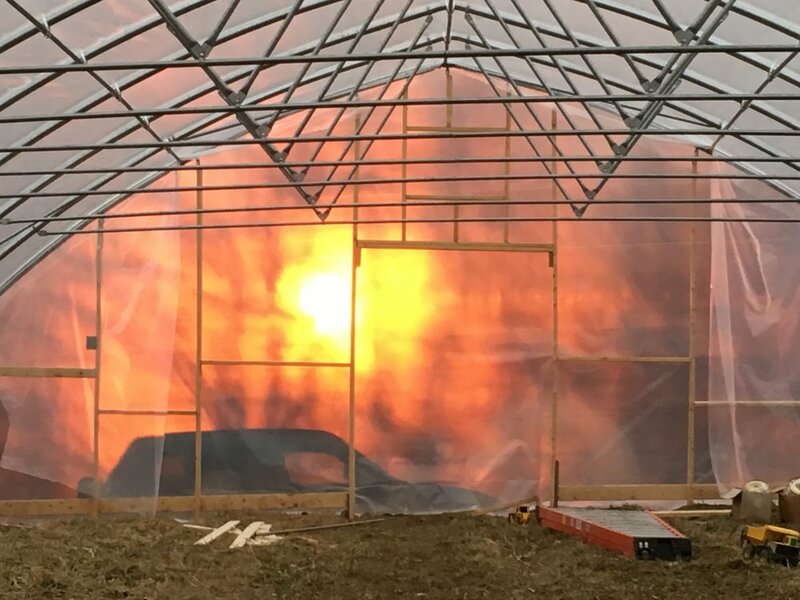 Sunset from inside the new high tunnel. With April just around the corner, we’re happy to report that the CSA is over half full. This is great news for early spring. We have a good idea of how many members will return each year, so we’re on track to sell out for the fifth year in a row. Hope you’re enjoying your spring. It’s been busy but good at PTF.